Smucker's Jelly in Foodservice Portion Control Trays. 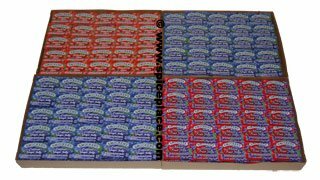 Assortment # 12 Contains 200 total trays each containing 1/2 ounce of Smucker's Jelly. Carton contains 100 1/2 ounce Grape Jelly trays, 50 1/2 ounce Mixed Fruit Jelly Trays, and 50 1/2 ounce Strawberry Jelly Trays in individually sealed plastic trays. Ingredients in Smucker's Concord Grape Jelly: Concord Grape Juice, High Fructose Corn Syrup, Corn Syrup, Fruit Pectin, Citric Acid, Sodium Citrate. Ingredients in Smucker's Strawberry Jam: Strawberries, High Fructose Corn Syrup, Corn Syrup, Sugar, Fruit Pectin, Citric Acid. Ingredients in Smucker's Concord Grape Jelly: High Fructose Corn Syrup, Corn Syrup, Grape Juice, Apple Juice, Fruit Pectin, Citric Acid.